Now that Thanksgiving has passed, it’s time to start checking items off your holiday gift list. Stores have long ago begun set out the Christmas decorations and displayed their items in ways that target your inner shopaholic. And as wonderful as it can feel to purchase a present for someone else, do you ever reach the end of the holiday season only to realize you’ve exceeded your budget? Whether you get carried away purchasing for others, or simply fall victim to the enticing holiday displays, many Christmas shoppers get home only to find themselves overcome by a wave of guilt and buyer’s remorse. 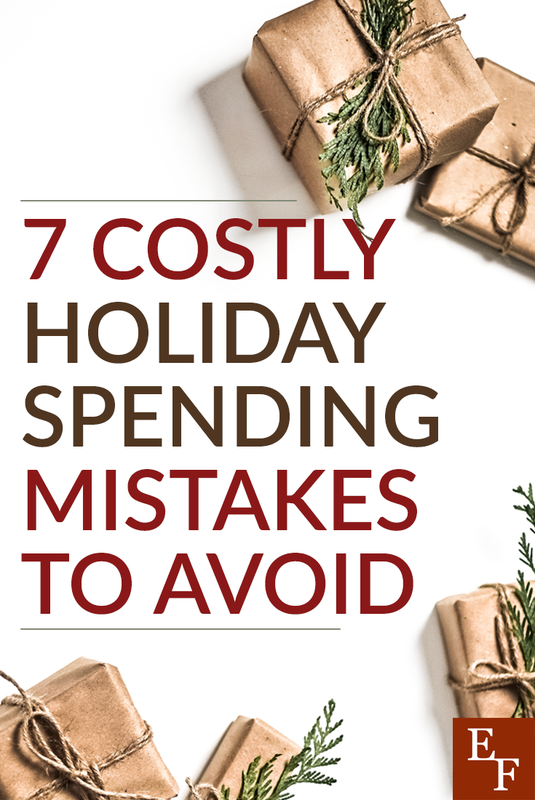 To commence this holiday season on the right foot, carefully consider these 7 holiday spending mistakes, so you’re equipped to avoid them. Like grocery shopping, or shopping for yourself, anytime you enter a store without a list or plan of action, you’re bound to spend more than you thought. Shopping without a list or budget makes it all too easy to purchase something out of your price-range, because you love it, are persuaded by fancy displays or packaging, or are simply overwhelmed by choices. Before you hit the stores, compile a list of everyone you wish to purchase for, a solid gift idea set for each, and a budget for each gift. By doing so, you’ll stay on course with what you need to buy and ensure you don’t go over your monetary limit. Whether you failed to save up beforehand, or would like to buy gifts that exceed what’s in your bank account, switching to your credit card and going crazy is the most dire of holiday spending mistakes. You might think you can simply pay it off later, and while that is an option, it’s never easy to dig yourself out a hole once you’ve created one. Racking up debt is never a smart spending practice. Instead of going into your holiday shopping spree blind, take the time before the season hits to set a budget, and then, set that cash aside. That way, what you have to spend is what’s in your hand. Trust me, it’ll be a lot less tempting to pull out the credit card if you’re paying in cash. Yes, going to multiple stores or browsing online to compare the price of every gift is a bit of a task. Nonetheless, certain items are simply more expensive at certain stores or merely don’t have the deals and coupons other establishments possess. And thanks to the Internet and sites like Googleshopping, you can price shop from the comfort of your own home. Seek out the gifts you want and make a list. Then, be sure to input each of those presents into a price comparison site. Or if you don’t mind it, go to other stores, to ensure you’re receiving the best deal possible. You’ll be surprised how much price shopping can save you and keep you within budget. Deals spread throughout the stores and featured in mail and newspaper advertisements are designed to catch your eye. After all, that’s why they work so well. That being said, while a deal might seem like great savings, they’re sometimes too good to be true. Often times deals and coupons require you to spend when you might not have only to earn a free gift or extra item. So, while it might seem like you’re saving, you’re in turn, spending money on something you might otherwise not have purchased. Carefully read the fine print and requirements of every deal before taking advantage of them. Make sure it’s something you truly need to purchase. Plus, be sure that the deal or coupon is actually saving you money in return. Being generous during the holiday season is second nature. Between the lights, music, and all-around good cheer, it’s easy to keep adding people to your list. You might even add people you wouldn’t normally think of. Although it’s a wonderful ideal to purchase everyone in your life a gift, not only is it not necessary, but it’s expensive. Before making your holiday list, carefully consider those most important in your life. Do your best to narrow down your list, especially if your budget is tight, to keep the price reasonable. More likely than not, your third cousin that you never see, or the co-worker you’ve only met once, won’t miss your present. Trying to impress the people in your life through gifts is outlandish and a terrible spending habit. Thanks to social media sites like Instagram, the idea of “keeping up with the Joneses,” is truer than ever before. It can be difficult not to feel like you should by expensive gifts to keep up with those around you and impress your friends. Don’t focus on how much you can spend on gifts, especially if you know it’s not in your budget. Instead find thoughtful options and stick to your price-range. Those who receive your gifts will be just as grateful, and so will your wallet. Christmas comes every year, and you no doubt know exactly when to expect it. That being the case, don’t wait until the last minute to purchase your gifts. You not only give yourself zero time to shop around for the optimal price, but also put yourself under added pressure that might cause you to scoop up the first thing you find, no matter the price. Give yourself plenty of time to find the right gifts, at the right price. Cliché as it might sound, there truly is more to the holiday season than gifts. Don’t get caught up in the latter to the point that you overspend and start the new year off poorly. Avoid these seven holiday spending mistakes and remember, it really is the thought that counts. Have you made any of these holiday shopping mistakes? What practices have you found to help avoid them?